Mysterious meteors have crash-landed in one of the the deserts of Ariadne III, long-range scans indicate that previously unknown crystalline formations have formed – possibly organic in nature! This could mean alien life – whoever makes first contact controls the information flow and potential research opportunities tied to this! The corporate government of the Ariadne system has sent the Drakensberg Protection Service (DPS) to locate and secure the meteor crash-site. However, the hidden network of eyes controlled by ARM (the Ariadne Resistance Movement) have also picked up on this meteor crash and dispatched a force of resistance fighters! In this game we welcome a new participant in the campaign, Martin with his Drakensberg Protection Service! They have the "Advanced medical training" doctrine, meaning they have a chance of saving fallen soldiers, reducing casualties. 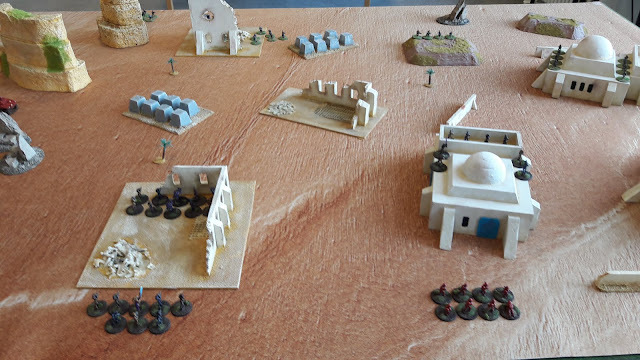 For the first time we are also trying out the Revolt supplement, a yet unpublished expansion to PMC which contains rules for fighting as a rebel force instead of a PMC – a completely new army list with its own units and special rules! Next follows the army lists for this Tier II battle! In their rules supplement there is no campaign rules, thus we play them as if they had the standard campaign rules. ARM has the "Rapid relocation" doctrine. - Armed civilian mob, Tier II – Lots of angry people with guns, intending to stay! - Secondary resistance leader, Tier II, HQ unit – First among equals! Yes, rebels have more composition points than PMCs! The table from the perspective of ARM, the small palm trees are the objective. Left HQ to the right deserters from a local militia. 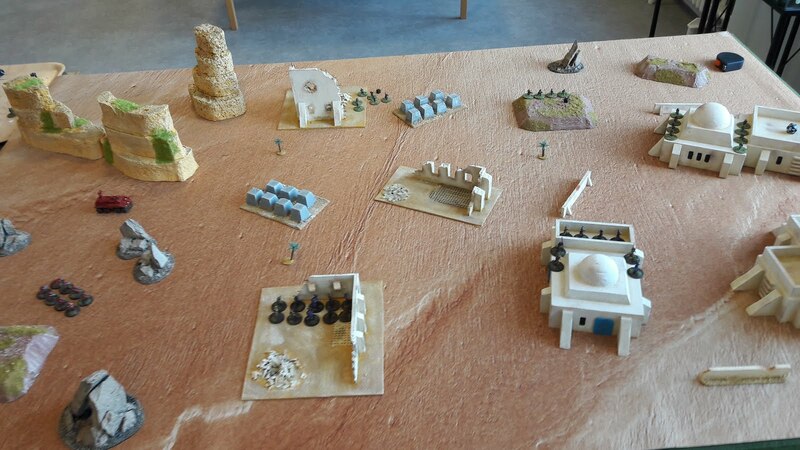 ARM deployed their support vehicle, LMG team, HQ and a team of deserters, all quite central. DPS deployed recruits and a heavy patrol vehicle on the south flank and irregulars to the north, in the centre a unit of nomads. 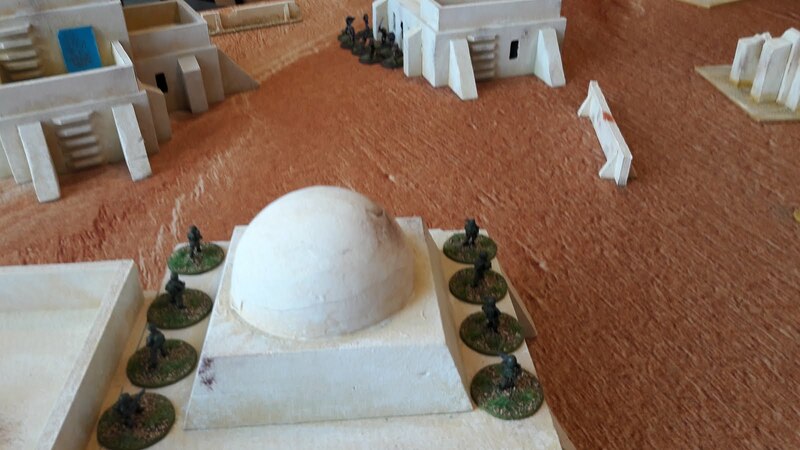 Both sides started to cautiously approach the objectives, in the centre the nomads searched the first suspected impact site and found the meteor! 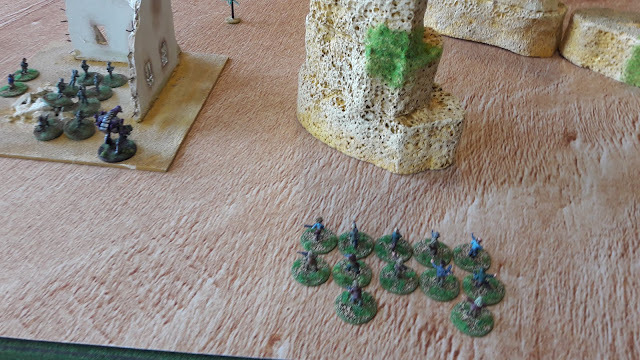 On the southern flank the heavy patrol vehicle rushed forward and hid behind a huge cliff, the recruits made a more conservative push and hid behind some rocks. 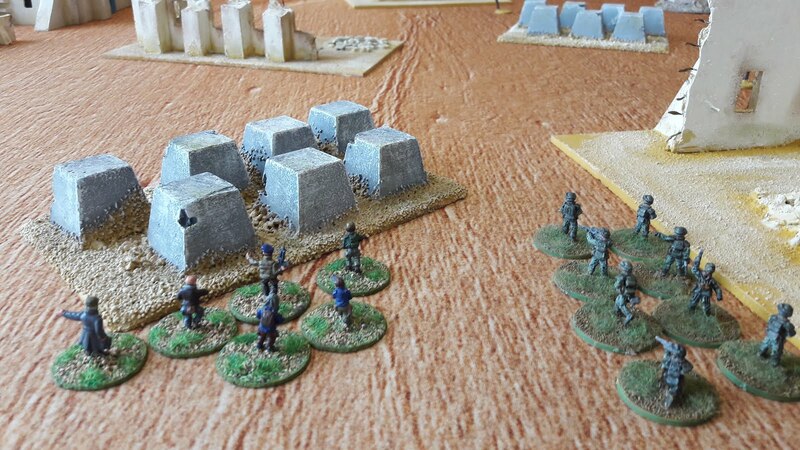 ARM concentrated their HQ and deserter unit in the central most rubble cautious about how to proceed. 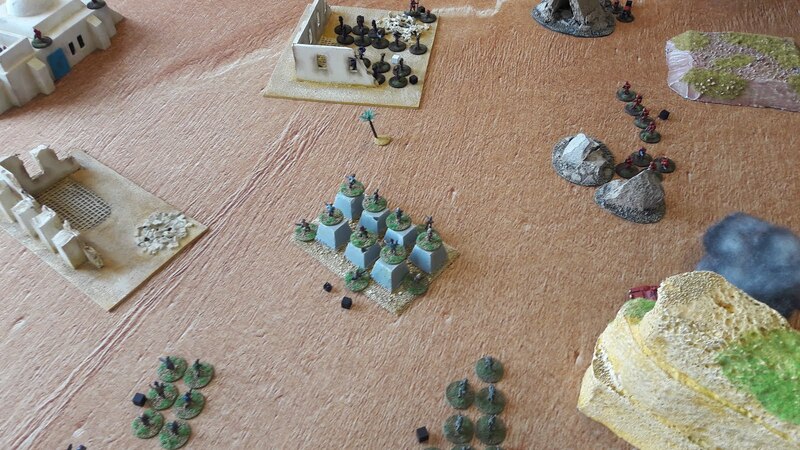 The support vehicle had a hard time finding a target as the nomads had stealth. The insurgents with LMGs climbs a hill to find a better firing position and sees some irregulars among some houses on the northern flank. They open fire but to no effect but the irregulars decides that safe is better than sorry and falls back. DPS irregulars advancing cautiously, they know very well that insurgents could strike at any moment! Surprise lead rain – the worst! Partizants show up in a building. 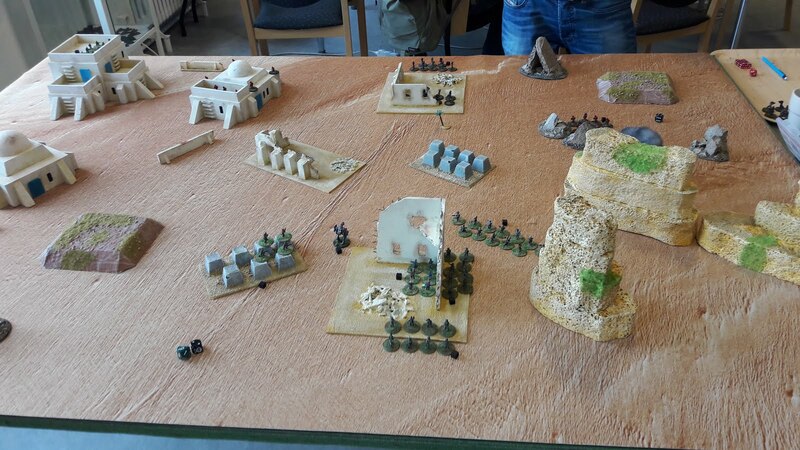 State of the table at turn 2! Suddenly a group of Partizants appear in one of the northern houses catching the irregulars of guard, breaking them with a mighty rain of fire despite the protection of the house the irregulars had taken cover in! Now reinforcements arrive on both sides, after hearing all the commotion some local farmers have taken up arms in aid of the cruel DPS joining the insurgents, they come on the centre of the ARMs line and charge towards the cliff where the heavy patrol vehicle has taken cover. They cannot take our freedom! – An angry mob of moist farmers join the fight! 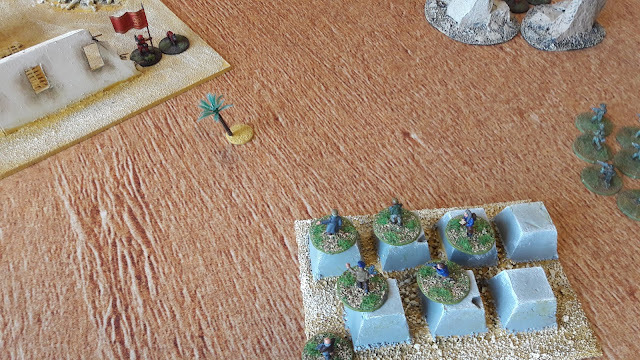 The vehicle approaches the edge and opens fire on the deserters. Fire is exchanged multiple times between the patrol vehicle and the deserters, HQ, improvised support vehicle and Insurgent LMG team but the patrol vehicle refuses to break, it even supresses the deserters. Will the insurgents be grinded down by this steadfast vehicle? No, the deserters are rallied by their leaders and place a carefully aimed RPG in the patrol vehicle lighting it up and putting it out of action! Last moments of the patrol vehicle! Meanwhile more reinforcements have arrived, another deserter team arrives on the side of ARM, DPS deploys a LMG team in the centre of their board edge, threatening advancement on the central objective. On the northern flank the partizants have taken up position in one of the large houses overlooking the house where the irregulars tried to hide only to find some that some recruits have taken up positions there instead, before they have time to fire they are set ablaze by the recruits scoring several kills, supressing the partizants for the rest of the game as they are unable to rally! The partizants pinned upper left, angry mob performing ”excellent screening manoeuvre” centre. Victory needs sacrifice! Preferably not fulltime members of the resistance! Sending the dirty nomads packing! We´re coming right behind you! In the centre ARM is pushing forward sending the very eager mob of civilians first, acting as a screen for the remaining infantry units against the DPS LMG team. The civilians are hosed with bullets but refuse to give in even as casualties mount. 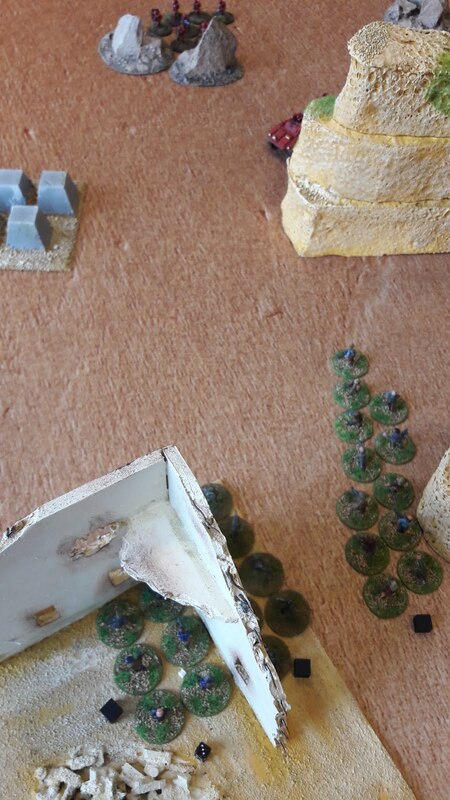 After the support vehicle manages to lock on to the Nomads and send them packing after sending them a 52mm love letter, they hold the objective and even repulse a unit of irregulars send to displace them before they are inevitably worn down and break of. A sacrifice has been made and the civilians are broken! The DPS HQ is making a stand! Eat lead evil bourgeoise lackeys! 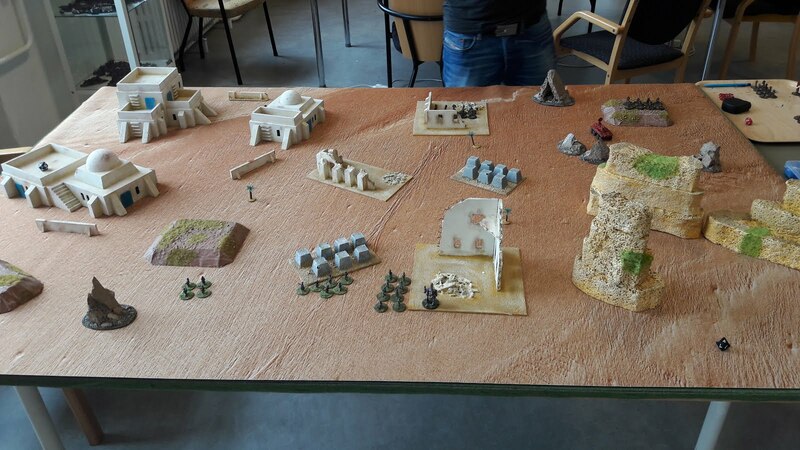 The HQ of both sides now rush for the objective taking up position in areas of rubble on opposite sides of the impact site, here they throw everything they´ve got but in the end the smaller DPS HQ is decimated and broken and since DPS have taken such heavy losses and no longer hold the objective they are routed! Victory to the people of the Ariadne system! This was our first try out of the Revolt supplement to PMC 2640. 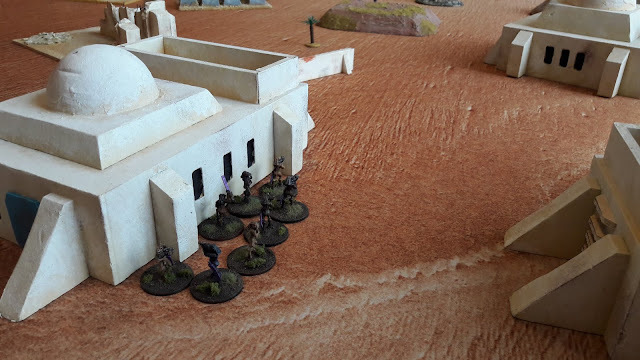 Before the game started I really thought I would be squashed as the rebels have generally quite short range, low defence and mediocre firepower, they are however very motivated with high morale and a few rules to offset morale effects of losses. They also have some units, such as the partizants with rules for infiltration which makes the game less static and of sets the generally shorter range of insurgent weapons. 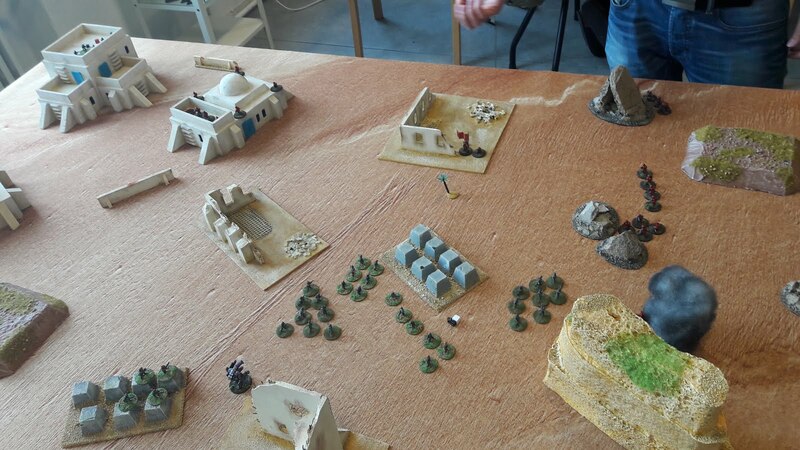 We agreed after the game that the rebels are a more aggressive army, wanting to be close and personal and they have the motivation the get there too so they are a nice contrast to the regular PMCs. Since their individual units are weaker they must concentrate their attacks more and run interference on other parts of the battlefield. One drawback is the model count of some of the units, the unit size of the mob of armed civilians is 12, but most units have size 8. Since we don´t have that many insurgent-looking models we have to go for more compact lists, limiting choice a little bit. In a campaign they might have a problem making ends meet as you then need to buy more high tier units and opponents will get more XP since they may break more units with a higher tier, on the other hand rebel units are quite hard to break! This is to some degree offset by the available vehicles that are size one and the deserter units which should be made up of models from the regular PMCs. One of the most brought up issues people have with PMC is the lack of different army lists, i.e. 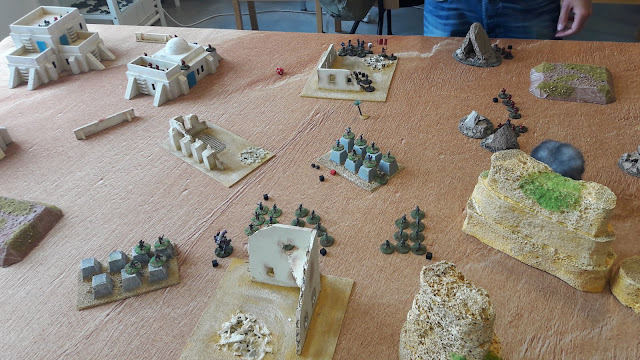 limited choice of units, if that was a problem (we don´t agree, just look at the legion and the Sickles) this fixes this in part and there are more supplements, hence even more army lists, that we just haven’t had time to paint the models for yet. We hope this battle report will generate some buzz so Assault Publishing continue to work on these supplements and release them! Viva la revolution! ARM out!